Update 2010: I have written a new Laem Hin Seafood Restaurant Phuket page - restaurant still as good as ever! 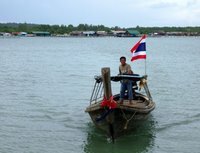 This post from 2006 - it was the first restaurant to be blogged on Jamie's Phuket! Phuket has many restaurants slightly off the beaten track and more or less unknown to tourists. Laem Hin Seafood is one of these. Popular with locals, it can get busy, especially at weekends. If you see a western face there, you can be pretty sure they live in Phuket. Location: A little North of Phuket Town, at Laem Hin. There is a signposted road off the main airport road. I think the sign is only in Thai. It's not far south of the Boat Lagoon, well worth a visit if you like boats and home to the Boat Lagoon Resort where we go and use the pool sometimes. Laem Hin has a small fishing community, there are old wooden houses on stilts and some newer houses closer to the main road. 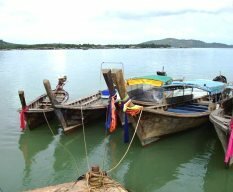 From Laem Hin jetty you can get boats to Koh Maphrao and Koh Rang. There are always some boats buzzing around. At Koh Maphrao there are some floating restaurants, also popular with locals. The restaurant at Laem Hin is built over the water with views across the southern end of Phang Nga bay. It's a seafood restaurant, with live fish, prawns, lobster, crabs in tanks ready to cook. When you order anything like this, the price is per 100g, and will often be more expensive than you think, even though this is not a tourist restaurant - more of a middle class Phuket local restaurant, and many Phuket people do have the cash to splash! The food always comes quickly - there is a big kitchen and lots of staff. The waitresses can be a bit grumpy, but that does not detract from the food, the views, the peace. 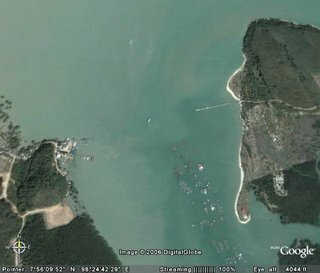 Google Earth has a high resolution scan for the east side of Phuket. The picture above shows Laem Hin (on the left) where you find the restaurant and a boat jetty, and the east side of Koh Maphrao, with its beaches and the floating restaurants. We went a few days ago. I had "yam gung seab" - dried shrimp salad, made with papaya, onions, tomato, chili, lime juice. Wife likes to eat spicy seafood soup. Big dish of rice, a few cokes. Get some fried rice and omelette for the kids. Add a side dish of "hor mok" (curried fish custard cooked in banana leaves). For us, a bit of an expensive meal out - total bill 400 Baht (10 US$). Look out for More Phuket Restaurant Tips. Update - there is a new Laem Hin Seafood Restaurant Phuket page on this blog, fully updated with new photos.